In the wake of the stupendous mega-hit Calvin & Hobbes, it's not surprising that syndicates tried over and over to recapture that lightning in a bottle. Unfortunately, lost among those me-too strips, shunned by most newspaper editors and newspaper readers, was Claire & Weber by Doug Shannon. On the face of it, Claire & Weber seems a transparent C&H wannabee -- change the little boy into a little girl, and the tiger into a frog, and what more could newspaper readers pining for the original want? Well, not Claire & Weber. Calvin and Hobbes it ain't. But what it is is a darn good strip on its own terms, with perceptive, well-written gags and nice art. The strip does have plenty of imagination, but it's far more down to earth than C&H, and Claire is written as a more average, typical kid than Calvin. 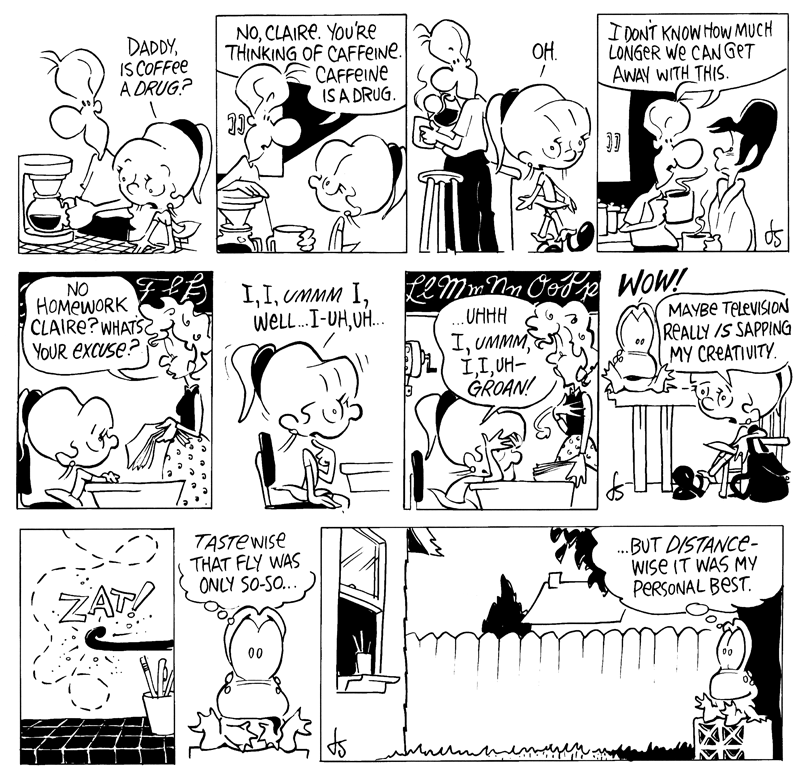 The strip is also gentler, more rooted in what kids of the 90s do in their free time (computer games for instance) and the relationship between Claire and her parents is warm but able to stand a little strife then and again. Claire & Weber was introduced as a Sunday and daily strip by King Features on January 5 1998, and didn't find a lot of clients out of the gate. In 1999 Shannon shortened the title to Claire, presumably realizing that the frog character invited unfortunate comparisons, and was a crutch he really didn't need. Not having seen late strips in this series, I don't know if the frog was dropped entirely, or just sliced out of the title. Unfortunately, the writing was already on the wall, and the strip was cancelled sometime in 2000 (anyone know the specific date?). It's too bad Doug Shannon has gone on to other pursuits. I think that if freed from the need to produce a copycat 'product' rather than an artistic expression all his own, we could have had a stripper to reckon with. Back when the Houston Chronicle ran archives on their website, they carried the daily Claire until December 30, 2000. For Sundays it was reported that Shannon ran a December 31, 2000 strip and titled it "Final December 31, 2000 Final". The January 14, 2001 Santa Rosa Press Democrat ran a notice stating, "Starting today, The Press Democrat will add Prince Valiant to its comic strip pages, replacing Claire." Seemingly putting the last Sunday strip on January 7, 2001. The above dates are hearsay and not eye-witness facts. and her talking frog, and was created by cartoonist Doug Shannon of Santa Rosa. King Features Syndicate, which also distributes Prince Valiant and many other strips, canceled Claire, Shannon said last week. out within the year,' Shannon said. Never heard anything more about the new strip. Thanks very much for all the info DD! I'm putting in tentative end dates of EITHER 12/31/2000 or 1/7/2001 in my records, and adding another item to my "to be researched" list. At least now I know the paper to go to to get the final word! Much thanks Allan for running these strips. I agree; the obvious comparison is there between this one and C&H, but just this sample made me laugh....wish they would have lasted longer. 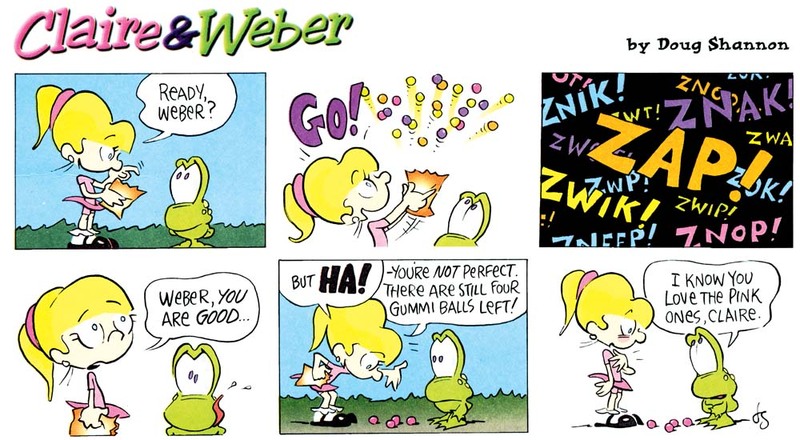 Gosh... "Claire and Weber" was one of my favorite childhood comic strips. It appeared on the Philippine Daily Inquirer in the late 1990's to early 2000's. I wish someone would revive this comic ang bring them back. I definitely miss them. I saw some of the later strips, and Weber did disappear for a while after the name got changed, but he returned few months later. If I recall, he said he was hibernating during his absence. Later strips? I wanna see it. 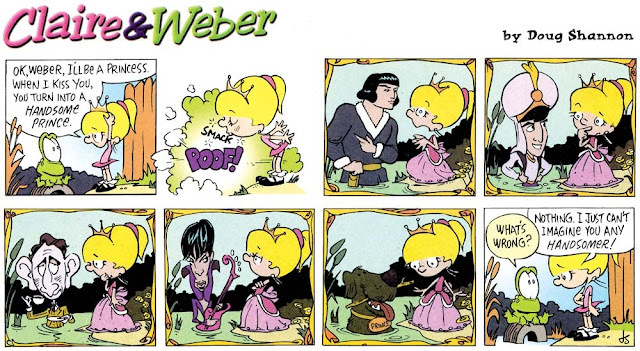 That Claire And Weber strip.